If your son or daughter is in the classroom of a teacher using Modeling Instruction, you’ve come to the right spot. For years, leaders in the Physics Education Research community like David Hestenes, Emeritus Professor of Physics at ASU, have recognized that the traditional lecture-demonstration mode of instruction is ineffective. Students can memorize procedures to get “the right answer” only on problems exactly like those they have practiced. They flounder when they run into problems which demand a real understanding of the concepts behind the formulas. Hestenes concluded that students learn best when they are guided to construct their own understanding of the essential ideas. 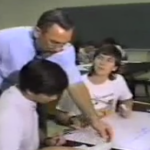 Working with experienced high school teacher Malcolm Wells, he helped to develop Modeling Instruction, an approach that emphasizes the construction and application of conceptual models as a way of learning and doing science. Your child’s instructor is one of thousands nationwide who has most likely attended (or is working closely with someone who attended) an intense summer workshop to learn how to implement this instructional approach. One of the key components is to avoid “teaching by telling.” Instead the instructor will guide your student to a deep understanding of the principles by asking leading questions and encouraging discussion among the students in class. Students used to viewing the instructor as the “source of knowledge” are sometimes put off, at first, by this approach. But they almost always come to appreciate being in a class where the instructor encourages them to express their own ideas by asking, “How do you know that?” and “Why do you think that?” Research shows that students in a class where they are actively engaged consistently outperform those in traditional classes. “But what about being prepared for college?”, you might ask. It turns out that a growing number of instructors at the college level are also switching to this mode of instruction. In the May-June issue of Harvard Magazine is an article by Prof. Eric Mazur describing how Dr. Hestenes’ research helped him realize that he had to move towards a more interactive approach. 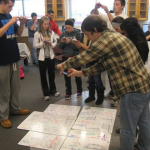 The Physics Education Research website has a list of frequently asked questions about various “interactive engagement” approaches; among these modeling instruction is one of the most popular. While these arguments are framed in the context of physics instruction, they apply equally well to other science and math classes. The most important thing to remember is that any concerns you might have about this approach are best addressed by a dialogue with your child’s instructor.